Codemasters’ latest online racing game has been something of a roller coaster for me. Watching the announcement trailer for Onrush, I like many others saw the resemblance to beloved series like Burnout or Motorstorm. Upon booting up the game I found about the same content I have grown to expect from Codemasters; Cool looking vehicles, minor customization, and some over the top gameplay. Jumping into the first dozen or so “races” I, unfortunately, found myself feeling a bit bored. The idea of Onrush seemed right, but it didn’t feel like it was burning on all cylinders. Wanting to give the game a fair judgment, I kept racing until I realized a problem I had not expected: I didn’t want to stop. Onrush is built to throw racing convention out the window, and as hard as it can be to do so, you need to give up these expectations of racing tropes to truly enjoy what Onrush has to offer. While I use the term racing in this review, there is no finish line as each course is objective based. At no point will you feel separated from the pack; beyond the game’s 5 vs 5 modes, the track is littered with CPU vehicles with the express purpose of ramming and destroying them to gain boost for your boost meter. At any given time you can expect to see at least a dozen of these glass enemies on screen to take them out as they will continuously spawn. 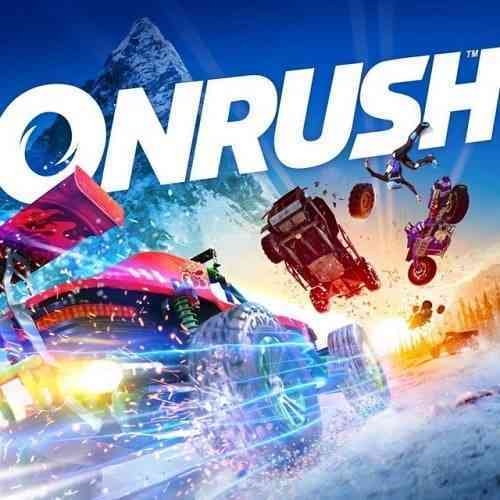 Onrush is about going fast. Rarely is there a moment you don’t want to be holding down your more than generous boost which refills through successful hits, landing a jump, doing tricks, and vehicle specific tasks such as driving close to allies or having near misses. In fact, you are more likely to get a hand cramp from holding in the gas and boost so long than to actually run out of boost. There are four weight classes and two vehicles per class ranging from the lightweight bikes to super heavy military grade APCs. Each individual vehicle has its own inherent ability, specific boost meter refill, and RUSH skill. RUSH can be unleashed for an even stronger, devastating boost that can almost be too hard to control. Each RUSH has a specific added skill such as dropping barriers that slow enemies, causing enemies to spin out of control, or leaving a trail of fire. 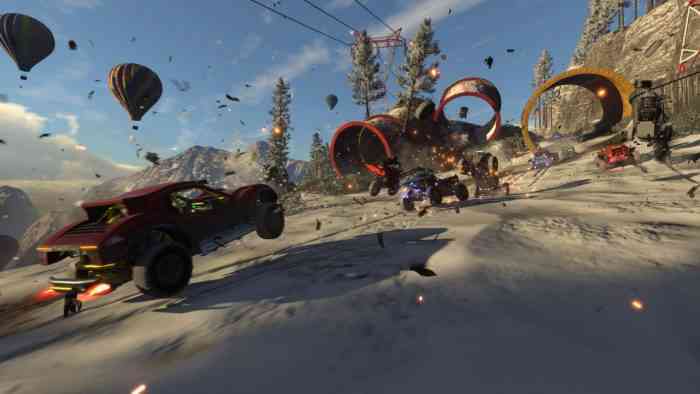 While Onrush does feature some single player options it is still primarily an online multiplayer game. Dropping into a match was incredibly quick – at most I must have waited a minute and a half for a match to start. 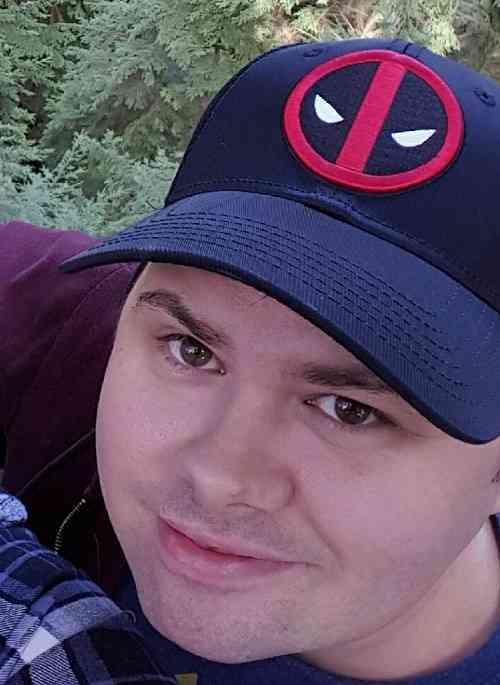 What makes Onrush feel even better is the fact players cannot upgrade their vehicles, so everyone has a level playing field. No one vehicle is particularly better than the next so, in the frantic carnage, no one has an unfair advantage. Sure a bike isn’t going to knock out an APC, but landing on top of one from a jump will destroy it regardless of size. No matter what mode you play in, the game will respawn you right back in the middle of the pack at full speed, so there is no catch-up; even falling too far behind will see the game drop you right back in the fray. While it’s great to keep the action going don’t be surprised if the game respawns you in a less than favorable situation. Several times I found myself dropped back into the action directly below a falling enemy only to be crushed or lined up perfectly with a tree. Courses are won through objectives: Countdown has you drive through small checkpoints with each pass adding one second to the team’s dwindling clock. Lockdown puts a mobile area on the map to capture based on which team has the most members within it. Switch, however, is my favorite. 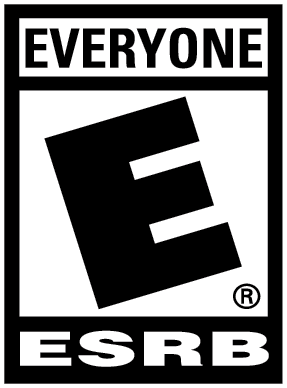 All players start as lightweight vehicles. Upon being wrecked, you move to the next class. By the time you reach the super heavy class, you are eliminated however you can continue to play as a super heavy in the hopes of knocking out the competition so your team can still win. The last team with points left wins. It’s fresh and intense, to say the least, making the five second respawn time feel like an eternity as you wait to get back in the action. The high-intensity soundtrack only adds more frenzy and makes it hard to put the controller down. Taunts, costumes, and vehicle skins can be bought through in-game currency awarded for various tasks and challenges, but leveling up will also gift you with a crate featuring three random prizes. Unless something really stands out to you, there isn’t much need to buy any of the items as you’ll undoubtedly unlock everything just by playing. The lack of customization options for the body of the vehicle or the character also feels like a missed opportunity, particularly considering the heavy level of customization we enjoy in most racing games. 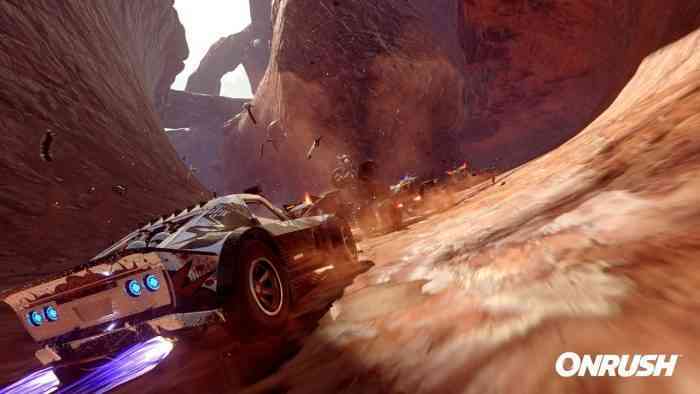 Onrush feels slow to start but once you dive in it can be addictive to play. With fast-paced, high-intensity encounters, a gamers competitive nature will quickly take over in this skill-based game of road rage and crazy tricks. Each vehicle feels unique and trying them all is paramount to discovering your perfect playstyle. With a fantastic soundtrack and simple controls, Onrush only falters in its lack of meaningful customization options. The single-player experience is lengthy and a great introduction to the various modes and vehicles, and online play is easily accessible to even newcomers. This is the best Codemasters game I have played and I can definitely see their growth as a developer.